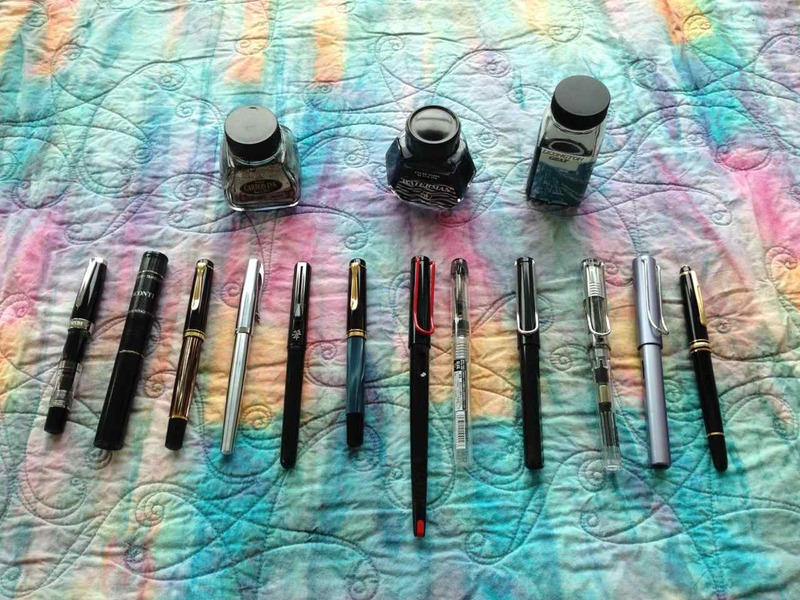 From left to right… TWSBI Mini Fine, Visconti Traveling Ink Pot, Pelican M200 Fine, Duke with bent calligraphy nib, Pentel Pocket Brush Pen, Pelican M200 Medium, Lamy Joy with 1.5 calligraphy nib, Platinum Preppy, Lamy Safari Extra Fine, Lamy Vista black EF, Lamy Al-Star F, and an old Mont Blanc rollerball, just because it writes well. 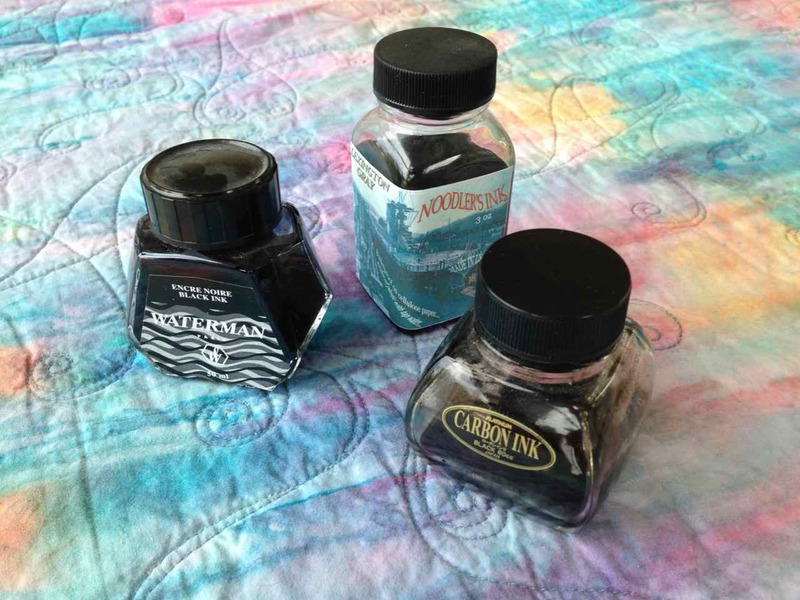 My favorites are filled with different inks for different purposes. My Pelican at the top is loaded with regular black Waterman ink… it’s soluble and bleeds wonderfully when hit with water. The silver Duke has Noodler’s Lexington Gray which needs a bit longer on the paper to become permanent. 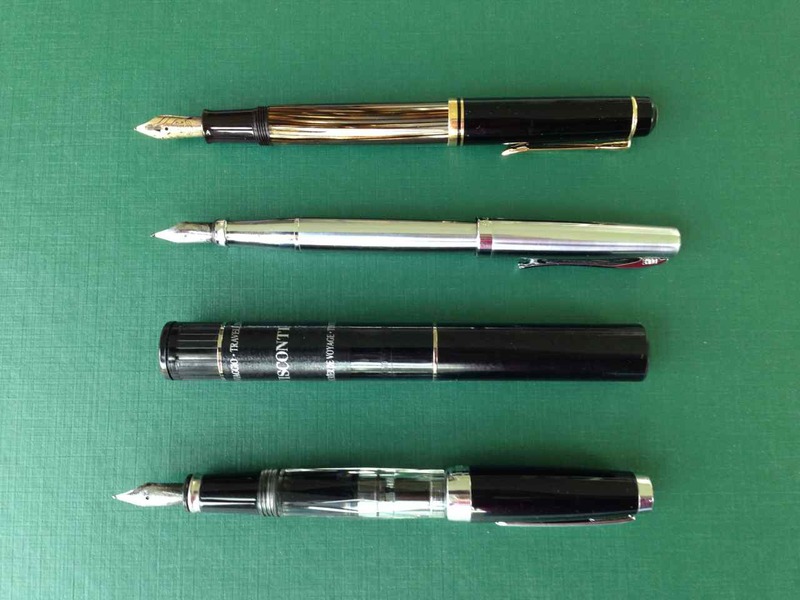 The lowermost pen is my beloved TWSBI Mini with a Fine point… LOVE! I’ve filled it with Platinum Carbon Black ink which has been the most reliably permanent ink I’ve tried. What’s that just above the TWSBI? It’s my Visconti Traveling Ink Pot… it holds plenty of ink for quite a few refills. I load it with the PCB and it tucks neatly into my TSA approved quart sized fluid bag for carry-on travel. I’ve been away for more than 2 weeks and it’s served me well! At this point I only have black fountain pen inks but I’m planning on remedying that! I have an order pending with my friends at Goulet Pens. FAIR WARNING! Do not click that link unless you are prepared to spend substantial time and have your credit card handy. Addicted? hmmmmm…. Obsessed? OK, I’ll give you that.